Why Haven't Humanities Ph.D. Programs Collapsed? The job prospects for new Ph.D.'s in fields like history and English are miserable, yet students keep signing up for their shot at the ivory tower. Readers, tell us what you think is going on. Last week, the Council of Graduate Schools delivered a truly baffling piece of news. From 2011 to 2012, it reported, the number of first-time students enrolled in arts and humanities Ph.D. programs had grown 7.7 percent. Yes, grown. Despite the slow-rolling extinction of the tenured professoriate; despite the fact that academic job openings haven't even come close to recovering from the recession; despite ample doomsaying from publications like The New York Times, it seems students are still signing up at a healthy clip to pause their lives for six years in order to study English, history and the like. 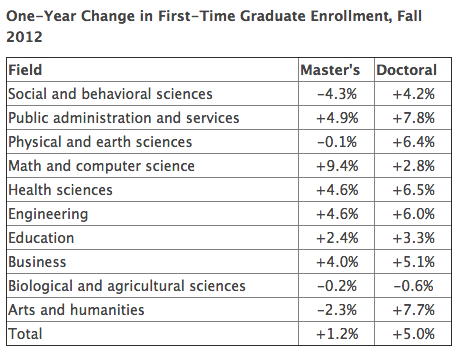 In fact, the enrollment bump was larger in the arts and humanities than almost any other broad field, with the one exception of public administration, as shown on this table from Inside Higher Ed. All of this leads to me to wonder: Why haven't arts and humanities Ph.D. programs imploded yet? We know, thanks to the collapse of law-school applications, that undergraduate students (as a group, at least) are entirely capable of looking at the job market and making rational decisions about whether or not to pursue a graduate education. Yet in the arts and humanities, in which 43 percent of new Ph.D.'s had no job or postdoc offer by graduation in 2011, there's no real sign of change. From 2007 to 2012, total enrollment fell by a measly 0.4 percent per year,* according to the Council of Graduate Schools. Meanwhile, departments go on merrily producing more new doctorate holders than there are jobs in the academy. And 2012 just brought us a bumper crop of aspiring scholars. I'm going to offer a few very lightly sketched out theories in a second, but mostly, I want to hear from you, the readers. What's keeping arts and humanities Ph.D. programs afloat? If you're studying for a Ph.D. in the classics right now, what drove your decision making? What information did you or didn't you have? If you're a professor, does your department ever discuss shrinking down your incoming class size? Do students seem to have a realistic sense of their chances when they arrive for their first year of grad school? Or do you think I have it all wrong? Is everything really fine? After a few days, I hope to collect the best and most interesting answers for a followup post. First, arts and humanities students aren't necessarily the most career-minded or pragmatic individuals; they go to school to study what they love, then hope for the best. There aren't very many arts and humanities Ph.D. students in the country (roughly 5,000 graduate in a given year). And no matter how badly the job market might degenerate, there will always be enough lit and history lovers around with a blithe sense of professional invincibility to fill classroom seats. University departments look at grad students as inexpensive labor, and so have no incentive to cut back on enrollment. Foreign students are helping to prop up departments. Graduate students aren't aware of how much debt they might take on in the process of earning their Ph.D. The general interest media haven't paid enough attention to the problems of the academic job market, and undergraduates frankly aren't sitting around reading the warnings from Chronicle of Higher Education. Alright, those are my shots in the dark. Now have at it in the comments. *Correction, Sept. 17: An earlier version of this article stated that enrollment declined 0.2 percent per year, rather than 0.4 percent. It fell at a rate of 0.2 percent only among men.